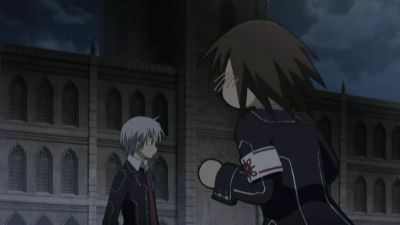 episode 1. . Wallpaper and background images in the 뱀파이어 기사 club tagged: vampire knight yuuki zero vampire kaname knight love. This 뱀파이어 기사 Screencap contains 거리, 도시 현장, 도시의 설정, 도시 장면, 도시 설정, 도시 거리, and 도시 장면 설정. There might also be 갈색 사암, 사암, surcoat, and 외투.